Linear atrophoderma of Moulin (LAM) is a rare dermatosis characterized by hyperpigmented and depressed band-like lesions localized along the Blaschko lines. LAM most commonly prefers the trunk and the limbs, while it is more rarely localized in the head and neck region. So far, any case of isolated facial lesion has not been reported. We present a-36-year old male patient with isolated facial lesion. We were observed slightly improvement in the lesion with topical calcipotriole therapy for 2 months. Linear atrophoderma of Moulin (LAM) is a dermatosis characterized by hyperpigmented and depressed band-like lesions localized along the Blaschko lines. This dermatosis was described for the first time by Moulin et al. in five patients with similar characteristics in 1992 and referred to atrophoderma of Moulin, with referrance to the first publication [1,2]. Major characteristics of LAM are being unilateral, following the Blaschko lines, long remain unchanged, onset in the childhood or adolescent period and lack of the induration. The lesions indicate progression over the first few months, then after having a linear atrophic state they stop the progression, limit themselves and become persistent . Despite clinically atrophic appearance of the lesions, elastic and collagen fibers are usually normal in histopathological examination . Etiology of LAM is unknown. Its localization matching the Blaschko lines is thought to be a reflection of mosaicism, which is believed to develop due to a somatic mutation occurring during early embryogenesis [4,5]. LAM most commonly prefers the trunk and the limbs, while it is more rarely localized in the head and neck region. So far, any case of isolated facial lesion has not been reported . Best to our knowledge, the patient who was presented here is the first case with isolated facial lesion. A 36 years old male patient presented with the complaints of line-form depression in the left lower half of his face and darkening of skin color in this area which has been emerged 8 months ago. In dermatologic examination, a purplish brown depressed lesion of about 10 cm length which followed the Blaschko lines was observed (Fig. 1). The patient had not any subjective complaint. There was no family history of similar lesions or skin disease. In skin biopsy from the lesion, there were thinning in the epidermis and flattening of the rete ridges with vacuolar degeneration in the basal layer. In the papillary dermis, mild edema, perivascular mononuclear inflammatory cell infiltration and diffuse melanophages were observed (Fig. 2). No change was observed in the collagen fibers with trichrome stain (Fig. 3). 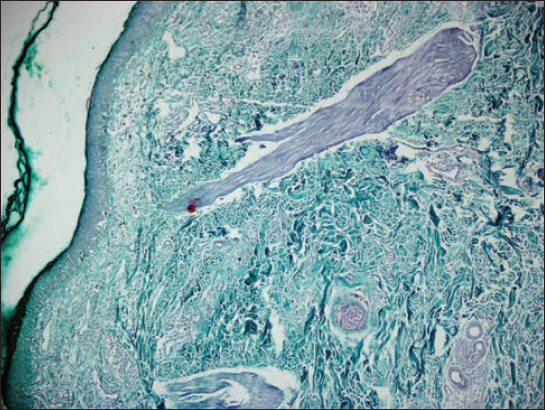 Elastic fibers were found to be normal with elastic staining. Antinuclear antibody, anti-histone antibody, anti-ds DNA and rheumatoid factor were negative. Erythrocyte sedimentation rate, full blood count and biochemical parameters were in the normal range. The patient was diagnosed for LAM with these findings. No any progression or regression was observed in the lesion during follow-up over 3 months. For treatment, topical calcipotriene cream was administered two times a day. Two months after treatment with topical calcipotriol, we were observed reduction in pigmentation and atrophic appearance with slightly improvement in the lesion (Fig. 4). 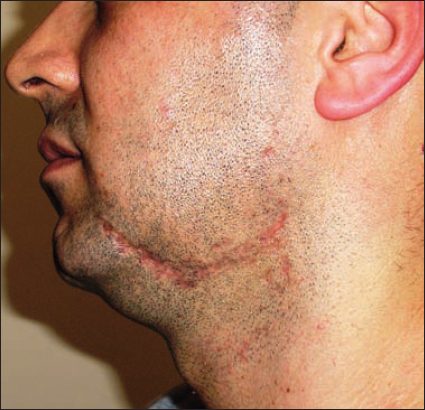 Figure 1: The purplish brown, depressed lesion which followed the Blaschko lines on the chin. Figure 2: Thinning in the epidermis and flattening of the rete ridges with vacuolar degeneration in the basal layer. Diffuse melanophages in the papillary dermis. H&E, ×200. Figure 3: Trichrome stain ×100. 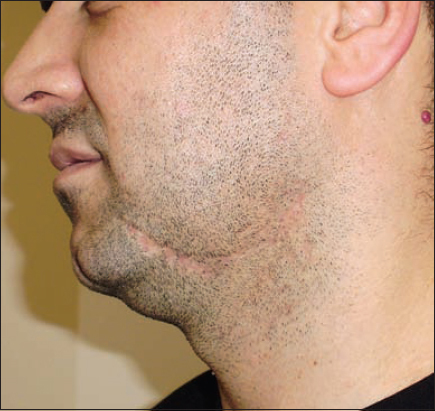 Figure 4: The appearance of lesion two months after treatment with topical calcipotriol. It has been reported about 30 LAM cases in the literature until now . LAM is most commonly occurs in the trunk. In the reported cases, the most affected regions in order of frequency were the trunk, arms, legs and neck. Cervicofacial localization was reported extremely rare. There was no isolated facial involvement in the two cases which were previously reported to have facial lesions with atypical characteristics for LAM . In a case report by Miteva and Obreshkova,  hypopigmented, atrophic and mildly slightly depressed lesions were reported to extend from the axilla to the wrist and mandible in the right arm. Multiple telangiectatic macules were reported in the same patient, which followed the Blaschko in the hip and leg, and the authors suggested that this case might be a different variant of LAM. It was reported in a LAM case by Browne and Fisher  that the lesions were bilaterally present in both the lower extremities, right upper extremity, right half of the trunk and right part of the chin. These findigs were not compatible with the unilateral nature of LAM . Differential diagnosis includes some dermatoses following the Blaschko lines such as focal dermal hypoplasia and incontinensia pigment as well as idiopathic atrophoderma of Pasini and Pierini (PPA) and linear morphea [2,7]. LAM and PPA are clinically similar in the presence of asymptomatic, hyperpigmented and depressed plaques and histopathologically lack of sclerosis in both diseases. However, PPA typically tends to be bilateral and simmetric in distribution and does not follow the Blaschko lines. Whereas it is not clear whether linear morphea follows the Blaschko lines or not. 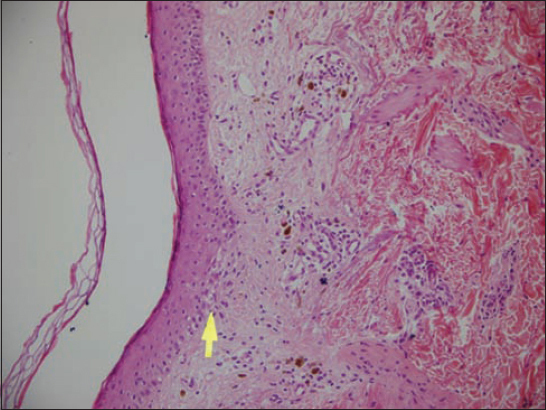 Nevertheless, histopathological features of LAM are different from those of morphea . Also, this case was distinguished from linear atrophic lichen planus by absence of lymphohistiocytic lichenoid infiltration in dermis. Histopathological features in LAM are characterized by mild epidermal atrophy, hyperpigmented basal layer, perivascular lymphocytic infiltration and presence of melanophages in the papillary dermis. Despite atrophic appearance of lesions, elastic fibers are usually normal in histopathological examination [2,7]. The present patient was differentiated from PPA and linear morphea with the clinical and histopathological features. Because of rarity and self-limiting feature of the disease, there is not a proven effective treatment regimen for LAM . High dose penicillin, intravenous penicillin together with topical PUVA therapy, topical corticosteroids, heparin, oral potassium paraaminobenzoate have been used for LAM treatment. These treatment regimens have been found partial effective on some cases but ineffective in most cases [3,6]. Lastly Zaouak et al. reported that they received good response to treatment with 20mg/week methotrexate in the case of extensive LAM. Wongkietkachorn et al. reported a case of LAM with partial response to topical calcipotriol. They suggested that treatment should be started early in order to achieve good response. We also applied topical calcipotriol two times a day in our patient. Two months after treatment with topical calcipotriol, we were observed reduction in pigmentation and atrophic appearance with slightly improvement in the lesion. Herein presented case is the first with characteristics of LAM which is only facially localized. The outcomes of previous cases and our result we have achieved in this case are important for the assignment of treatment regimens for LAM. 1. Moulin G, Hill MP, Guillaud V, Barrut D, Chevallier J, Thomas L, Bandes pigmentées atrophiques suivant les lignes de BlaschkoAnn Dermatol Venereol 1992; 119: 729-6. 2. Villani AP, Amini-Adle M, Wagschal D, Balme B, Thomas L, Lineer atrophoderma of Moulin: Report of 4 cases and 20th anniversary case reviewDermatology 2013; 227: 5-9. 3. Wongkietkachorn K, Intarasupht J, Srisuttiyakorn KA, Nakakes A, Niumpradit N, Linear atrophoderma of Moulin: A case report and review of the literatureCase Rep Dermatol 2013; 5: 11-4. 4. Miteva L, Obreshkova E, An unusual manifestation of lineer atrophoderma of MoulinActa Derm Venereol 2002; 82: 479-80. 5. Browne C, Fisher BK, Atrophoderma of Moulin with preceding imflammationInt J Dermatol 2000; 39: 850-2. 6. Zaouak A, Ghorbel HH, Benmously-Mlika R, Koubaa W, Badri T, Fenniche S, A case of linear atrophoderma of Moulin successfully treated with methotrexateDermatol Ther 2014; 27: 153-5. 7. Demirci GT, Altunay IK, Mertoglu E, Kucukunal A, Sak?z D, Lineer atrophoderma of Moulin on the neckJ Dermatol Case Rep 2011; 3: 47-9. 8. de Golian E, Echols K, Pearl H, Davis L, Linear atrophoderma of Moulin: a distinct entity?Pediatr Dermatol 2014; 31: 373-7.